LEC launched a campaign to give a donation to a charity during the holiday season. Collaborating with their in-house designer, I developed a website that explained the campaign and allowed anyone to submit a vote for their favorite charity along with a message of goodwill. The website tallied up the votes and also tweeted them after an approval process in the backend. The charity with the most votes received LEC’s donation. This form allowed people to submit a “wish” or vote for the charity of their choosing. 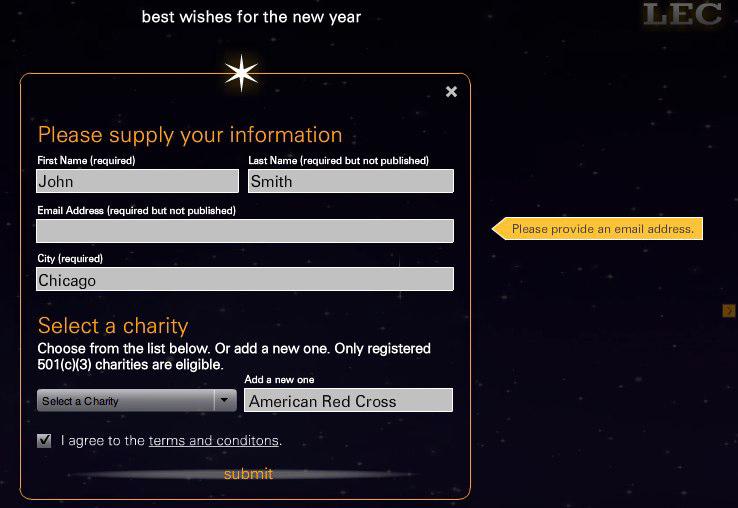 The website kept track of the “wishes” for each charity in the database and plotted them on the wish tracker.